Launched the Extend the Greenway Partnership, to work on our long-held goal to extend the Greenway over the river. More than 35 local organizations are now part of the Partnership. In the summer of 2018 we launched a new engineering study of the bridge over the river, to figure out how much it would cost to rehab it for bikes and pedestrian use. The study is about completed and a community meeting will be held in early 2019 to present the results. 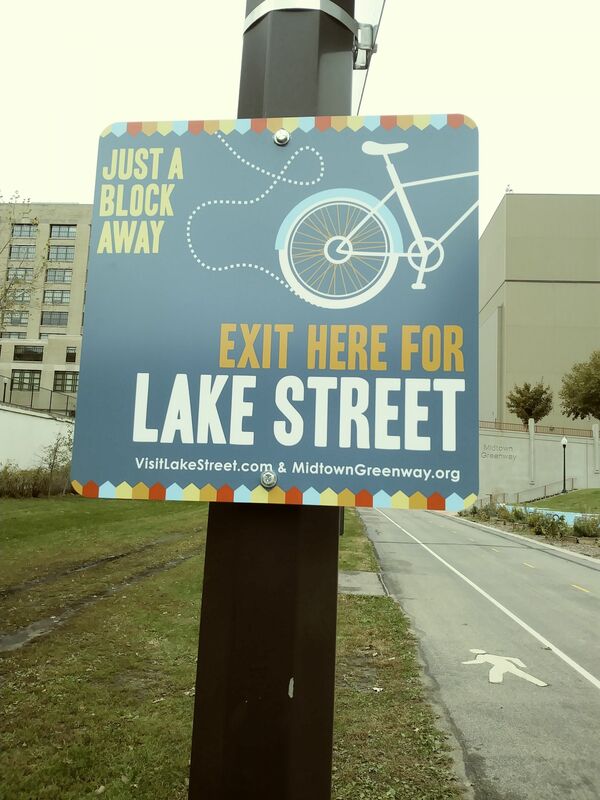 Installed a series of wayfinding signs and banners in the Greenway, informing Greenway users where to exit to get to Lake Street and Eat Street (Nicollet Ave.). Installed a temporary "woonerf" or shared street in the East Phillips neighborhood, designed to help make East 29th street safer for biking and walking and improve connections to the Greenway and the 17th Avenue Bicycle Boulevard. Results of the test will be used to advocate for making the street safer and more accessible for cyclists and pedestrians, and for better connections to the Greenway and the 17th Ave. Bike Boulevard. Installed two new murals in the Greenway, created by local artists of color. For the first one, we brought together MCAD and Little Earth of United Tribes to create the mural. For the second, we applied for an received a grant from the Metropolitan Regional Arts Council, then hired a local artist to paint the mural. In addition to creating vibrancy and advancing our vision for a cultural corridor, the murals help enhance racial equity in the Greenway. We also are proud that a new Renter’s Mural was installed in 2018, which was partially inspired by the MCAD and Little Earth mural. The new mural was installed by artists Cori Lin & Tori Hong with support from the Powderhorn Park Neighborhood Association. Took a leadership role in calling for safety enhancements and more community art for a new ramp that will be installed in the Greenway at 35W, leading to/from the new transit center at Lake Street. As a result of our advocacy, a grant of $250,000 for public art has been awarded for the ramp, and additional safety measures have been added to the design. Partcipated in a charette to visualize a future transit station area at Bloomington Avenue and the Greenway. The study helps advance our vision for a low-impact streetcar line in the Greenway. Celebrated the planting of the 5,000th tree in the Greenway as part of our annual Arbor Day efforts with the Midtown Community Works Partnership. Organized one of the largest outdoor arts festivals in Minneapolis – the Greenway Glow. Coordinated the Trail Watch bike patrol, led by dedicated volunteers who bike the corridor at night to help keep it safe. Coordinated 45 Adopt-A-Greenway organizations who organized more than 60 clean-ups. Our founders had the idea for the Greenway, then formed the Midtown Greenway Coalition to get it built. The corridor used to be a trash-filled trench that people avoided. Now, it contains a world-class biking and walking trail that's the envy of cities across the nation. 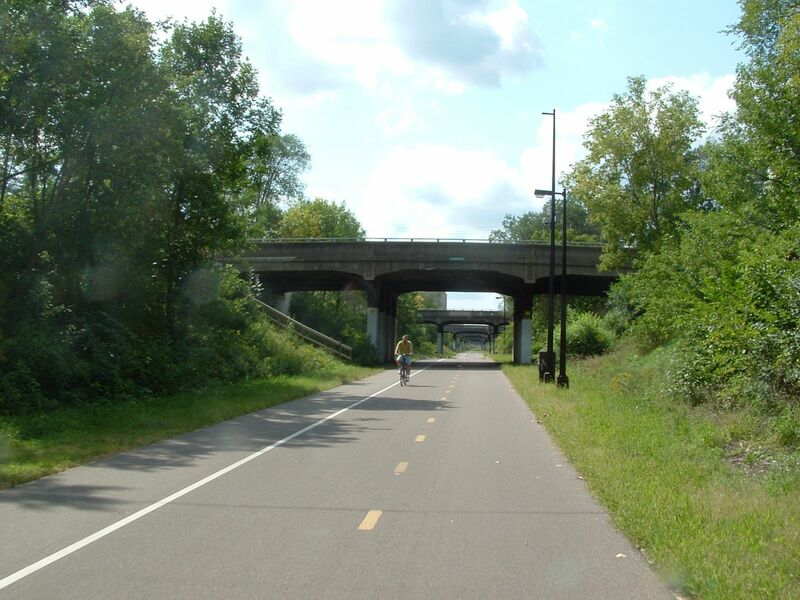 In fact, the Midtown Greenway trail has been named the best urban bike trail in the USA! Now, we work to protect and enhance it. We fought to keep high-voltage overhead power lines out of the Greenway – and we won! We encourage developers to create "Greenway-friendly" buildings along the corridor that don't block sunlight from the trail and create new access ramps and stairs. We operate a Trail Watch patrol, which bikes the Greenway at night to help keep it safe. We encourage government agencies to repair the trail when needed, and are currently advocating that the entire trail get on a schedule for repaving. We work to install more lighting and create safer street crossings. We operate greening and cleaning programs that help keep the Greenway green. We're a coalition of individuals and organizations that love the Midtown Greenway and want to protect and enhance it. We raise all of our own funds and receive no operational funding from the government. Use and love the Greenway too?